One half of the striking white relief globe can be detached at the equator to expose the Earth’s crust, mantle, outer core, and inner core. 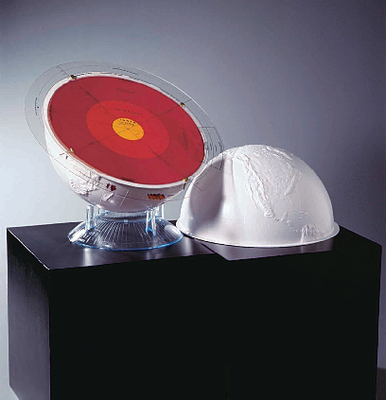 A removable, clear plastic disk rests on the cross section, detailing atmospheres, temperatures, air densities, and distances of each inner layer. In addition, the surface can be written on. The globe comes with a plastic base and an illustrated study guide. Size: 12" dia.